The past week has been quite interesting in respect to the conversion of various HL1/CS1 maps to the HL2/CSS Source engine equivalents. Not only have the first official screenshots of the Valve cs_assault conversion been released, but a good batch of screenshots for the Black Mesa: Source conversion were posted too. The difference in approach is worth a look. Specifically, the Assault remake is a reinterpretation of the original map, with many changes aimed at making the map better and more realistic. 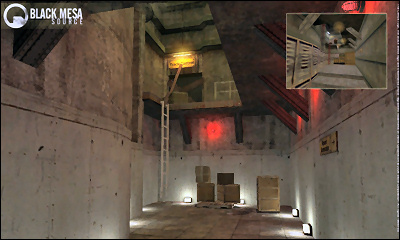 The Black Mesa Source approach has however been to maintain the original gameplay exactly, whilst making the world look better and more detailed than it was in HL1. Both approaches have the obvious benefits and drawbacks. As a matter of interest, one of the first CS:S maps I tried to create was a conversion of Assault. 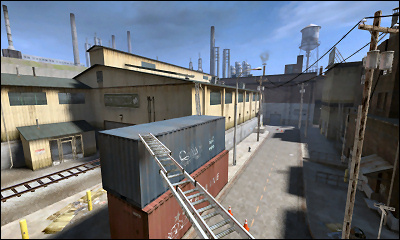 As my first CS:S map I was fairly proud, but I made one fatal mistake: I stayed too close to the original map. Not only was the layout and scale exactly the same, but the geometry and structure followed the same basic rules. I did of course make use of the Source engine to make it look better, but not even Source can rectify a fundamental error. The result was basically a higher-resolution, more detailed version of Assault, but with all the problems and issues of the original, plus some very ugly (thinking about it) aesthetic decisions I made. Embarrassingly, I got feedback from Cliffe and MacMan, highlighting spectacularly the mistakes I had made. Again, this all came down to me sticking too much to the original design, and trying to fit a new engine and new artwork to an old design. It doesn’t work. Trust me. That’s why the screenshots are of particular interest. First, Cliffe and Valve have done a tremendous job of completely redoing Assault, not least because trying to mutate an existing design like that is hard work. It’s a challenge keeping all the important and fun gameplay elements whilst fixing the issues and not being sucked into creating a brush-for-brush replica, or something entirely different altogether. What’s important though is that this is precisely the correct time to improve the map through radical changes. These opportunities don’t come often. On the other hand, I do wonder about the BM:S approach. Creating a conversion of an existing game is an admirable (and enormous) task, but trying to create a replica of the gameplay might be the crucial error here. If anything, this is the best opportunity to improve on HL1, and create new versions of the same basic missions, but actually making better use of the engine and not restricting it to the same basic structure as its father. It would perhaps be preferable to maintain the same concepts and basic layouts, but breathe life into them through sensible thinking and expansion rather than a new dash of paint (even if it does add more detail and depth, that isn’t enough). I suppose my fear is that conversions like these are inefficient: it is the chance to do so much more, so why limit your creation to the exact specifications of the original? A spanner should be thrown into the works, not just for the sake of being different, but to achieve something new and exciting. Something even more fun and immense and spectacular than before.